I love Boston Cream Pie. I also love cupcakes. So for my birthday I decided since you can't find such a treat in any bakery, I had to have them. I also can't believe how fast my life is going by me. Before you know it this will be a vintage blog! Since I love chocolate better than vanilla I guess I will reinvent the Boston Cream Pie into my liking, after all it's my birthday right? 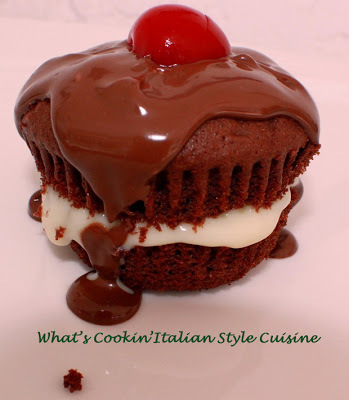 Yes, Chocolate Boston Cream Pie Cupcakes it is! 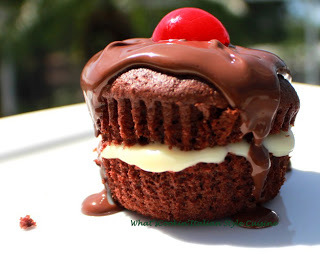 Melted chocolate ganache poured over the top with a vanilla filling... a perfect match! Melt chocolate and butter together in either a microwave or double boiler. After completely melted pour into a bowl and add the sugar, eggs, vanilla and beat with an electric beater. Add the dry ingredients until fully blended together around 2 minutes beating evenly. Pour into prepared lined cupcake pans. Bake on 350 degree hot oven until the middle looks dry and tooth pick in poked in the center comes out clean around 35 minutes. Cool completely. Make filling below. Heat the cream in the microwave or on stove top until it simmers. Add the chocolate let sit a few minutes. Add to a food processor and pulse until it is combined. If too thin wait until it cools to use as a frosting. Cut center out of each cupcake with a sharp knife carefully spoon in vanilla cream. 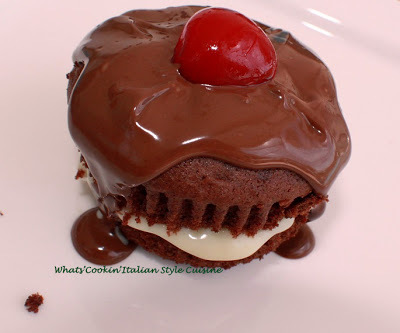 Spoon the ganache over each cupcake and add the maraschino cherry half on top.